Animatek is one of the main exponents on the spanish experimental techno scene. Known as Javik, he started to use the name Animatek only for his live sets. In 1993 starts as former part of the band Brainrack, where he makes several shows around Andalucia, being even in the line up with Chemical Brothers and playing on big festivals like Esparrago Rock. He was included on Eduardo de la Calle´s label first release Recorder, together with Groof, and got very good feedback from people like Richie Hawtin. 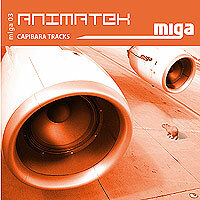 Now he combine his studioworks with the webmastering of www.animatek.net , a web focused on electronic music and the netlabel www.miga-label.org. He had the chance to share line up with artists like Richie Hawtin, Marco Carola, Dave Tarrida, Misstress Barbara, Steve Bug, Jeff Samuel, Sideral or being part of festivals like VIDEA 2000 in Barcelona, where he had a very acclaimed set. [Miga37] VV.AA "The engine roars"